What would happen if there is not even a gram of Iron in the World? There would be no nails, no railway cars, no locomotives, no automobiles, the plants would have faded away and died without the vital metal. As a matter of fact, humans would not have even lasted till then; having been deprived of the little grams of iron in the organisms, they would have died out before the events just described would have unfolded. To loose all iron – fine thousandths of one percent of body weight – would have spelled death for them. No animal life would have been possible without it . Iron is in the blood composition of all the representatives of the animal kingdom of our planet . Bivalent Iron – the substance carrying oxygen throughout the life of any living organism – is a vital component of hemoglobin. It is Iron that gives red color to blood. A person with a low iron content in his blood easily becomes tired suffers from headaches and is generally in low spirits. In Indian Ayurvedic texts “Lowh Bhashms” or “Oxides of Iron” used to be prescribed in medicines. In modern medicines, iron is given in the form of tablets, capsules or syrups. Iron is an essential part of plants also; for the formation of chlorophyll. There is Iron in the respiratory enzymes and it exerts a considerable influence on the respiration rate of plants. Hardly any other metal has been associated as intimately with the history of civilization as iron. Over the ages and millennia has man preserved his respect for iron and for people who work it. Some ancient people regarded iron more than gold. Only the wealthiest nobility could afford wearing iron decorations which were often set in gold. In ancient Rome even wedding rings were made of Iron, gradually, as metallurgy developed, Iron became cheaper and more available. Most likely the first iron that had fallen into man’s hands in hoary antiquity had not been of an earthly but of Cosmic origin. There was iron in the materials hitting the planet. In ancient languages Iron is called a “Celestial Stone”. In Russian Iron is called “Zhele Zo” which has come from: “Galja” a gel of Sanskrit. Iron is one of the most widely distributed elements on earth, the earth crust contains nearly 5% of it. Indian tribes made iron in a primitive furnaces. Indian steel was very famous world wide. King Porus presented a piece of steel to Alexender the Great. Indian Wootz steel was used for making famous Damiscus’ sword. The Konark sun temple has huge iron beams not corroded even after remaining in sea for years. In Delhi near Qutub minar, there towers a great iron pillar which baffles contemnors Scientist for its excellent corrosion resistance for 1000 years. The break of the 19th century was marked by a virtual intrusion of iron into technology. In 1778 the first iron ridge was built, in 1788 the first iron water lines were laid, and in 1818 the first iron ship was launched. The first rail road was commissioned in Britain in 1825. In 1889 the construction of magnificent iron tower designed by the outstanding French Engineer Gustav Eiffel was completed in Paris-300 meters tall. 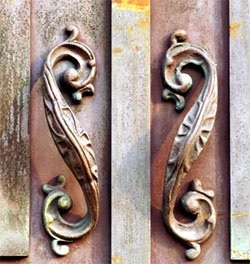 Rusting or corrosion is the greatest problem in Iron. A society to combat corrosion has been in existence in studies for about 1600 years. Now a days colored stainless steels and transparent stainless steel have been patented. The number of steels one comes across in the list of products turned out by a present day steel work is truly amazing. Stainless steel, high speed steel, ball bearing steels, spring steels, magnetic and non magnetic steels, high temperature and cold resistant steels. It will take quire a few pages just to enumerate all of them. Further machining of super hard materials e.g. Extra hard Diamonds, steels with about 5% tungsten’s used. A steel works in Belgium commissioned a mill for rolling of steel strip with embossed ornaments. The strip has been enthusiastically received by architects, car makers and makers of house hold durables. In Germany a bearing weighing 125 tons was made, while Switzerland produce mini bearings. A match box will contain 6,000,000 of such mini bearings . Development of powerful synchrophasotrons and the launching of space ship – none would be possible without Iron. However, Iron has not always served the purpose of creation. Many blood drained pages of history are associated with it. During the first and second world war Iron was used to shower people with thousand of shells and bombs. It was used to destroy what had been created from iron with the help of Iron.